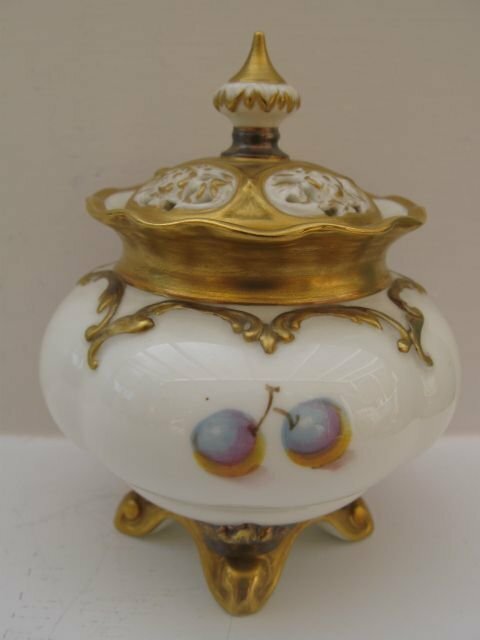 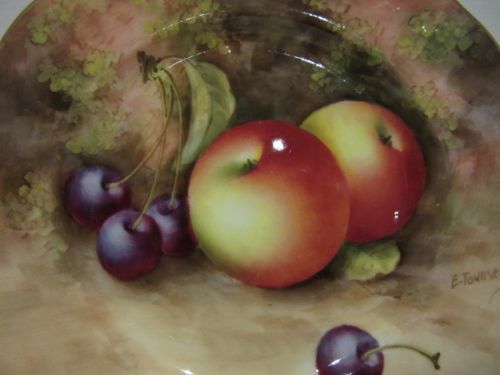 A Royal Worcester Fruit Painted Pot Pourri By W. Roberts. An attractive, Royal Worcester porcelain lidded pot pourri, shape number H261, with painted fruit decoration by William Roberts. 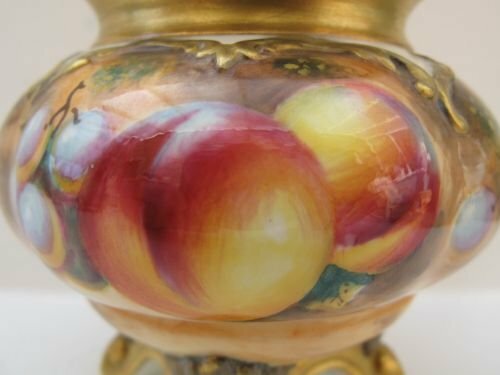 Standing approximately 4.1/4"overall height x 3.1/2" diameter and with the black factory stamp for circa 1970, it is in excellent condition with no damage, crazing or restoration, and the gilding is fresh and unworn. 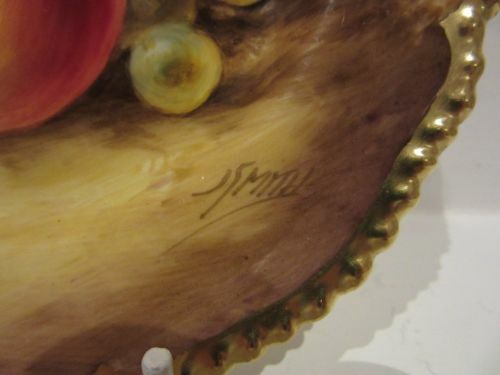 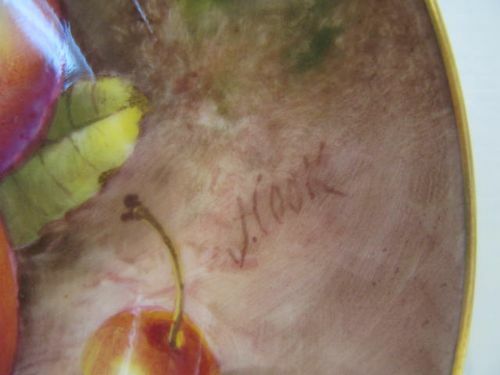 (Any apparent marks on the painted fruit are only reflections). An attractive Royal Worcester porcelain rectangular pin dish, with well painted fruit decoration by E.Townsend. 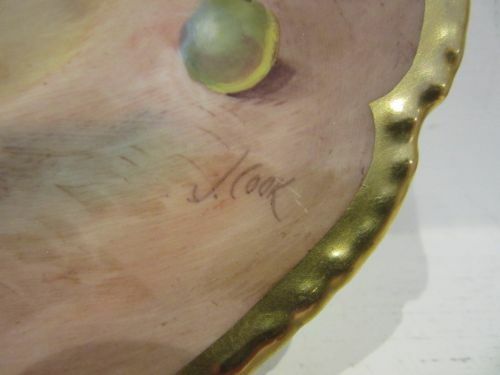 Standing approximately 6"long x 3.3/8" wide x 1"deep, it has the puce factory stamp for 1940 and is in very good condition with no damage, crazing or restoration and the gilding shows only the slightest signs of wear. 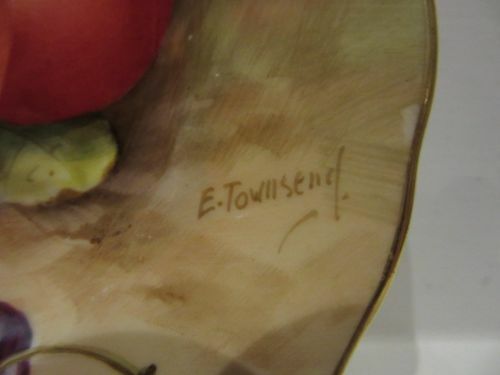 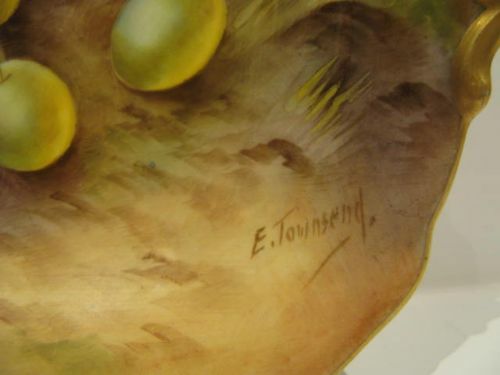 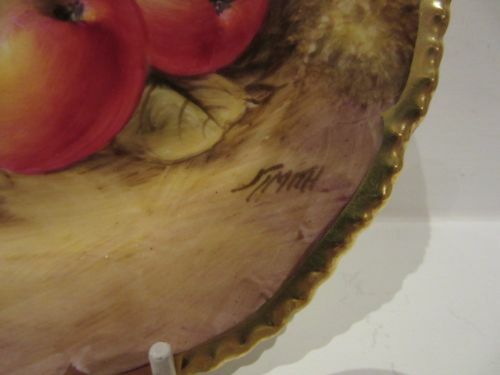 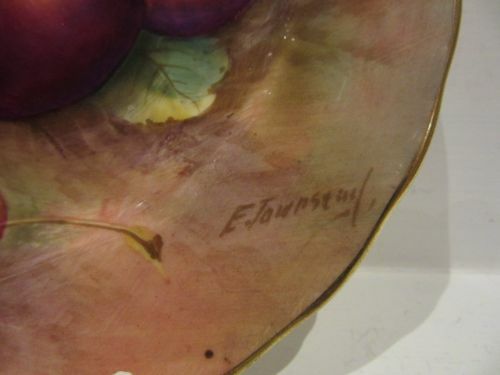 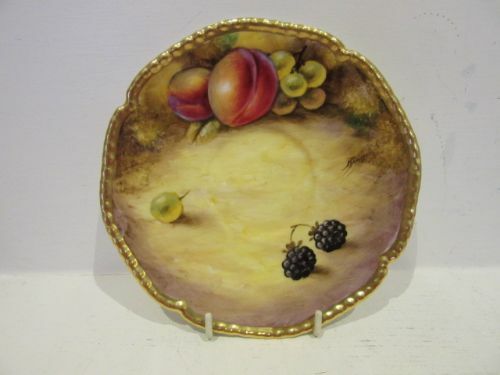 A Royal Worcester Fruit Painted Sandwich Plate By E. Townsend. 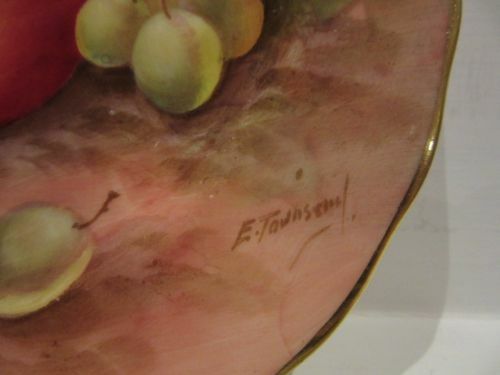 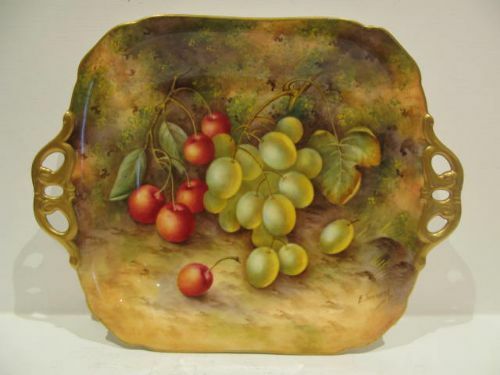 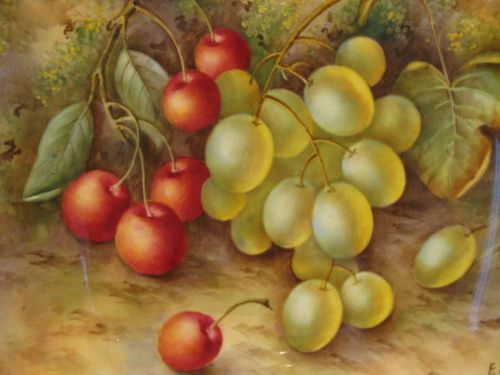 An good Royal Worcester porcelain sandwich plate, painted with an attractive and unusual combination of green grapes and red cherries by Edward Townsend. 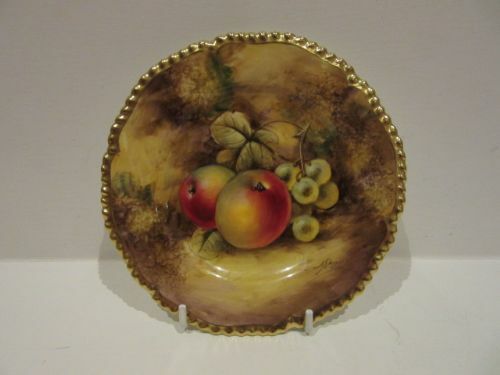 Measuring approximately 10.3/4"long x 8.1/2"wide x 1.3/8"deep, it has the puce factory stamp for 1937 and is in excellent condition with no damage, crazing or restoration and the gilding is without losses or rubbing. A Royal Worcester Fruit Painted Saucer By J Smith. A Royal Worcester porcelain saucer with shaped and heavily gilded gadrooned-rim, and decorated with well painted plums, green grapes and brambles against a mossy background by John Smith. 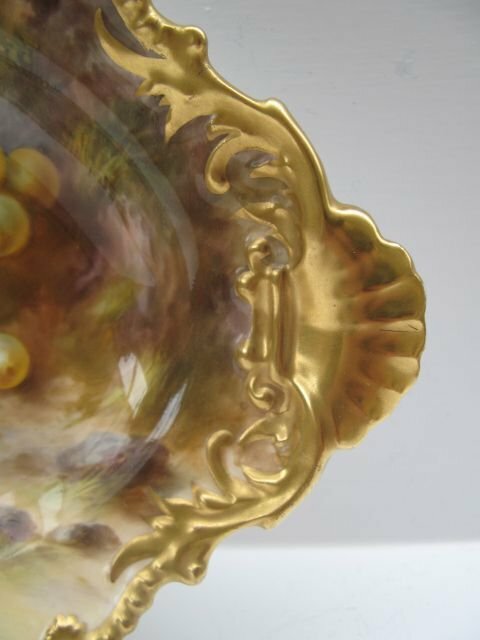 Measuring approximately 6"diameter, it has the black factory stamp for circa 1970 and is in excellent condition with no damage, crazing or restoration and the gilding is bright and virtually without wear. 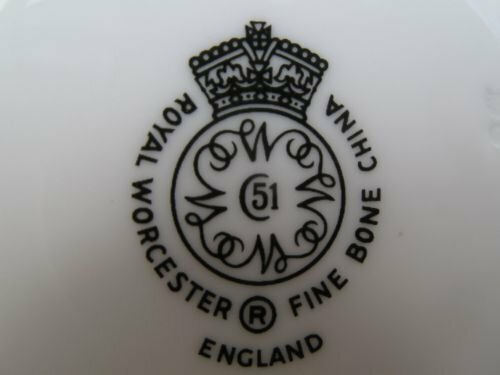 Perfect for anyone who has damaged or broken a gadrooned rim saucer and needs a replacement for the cup as these are quite hard to come by. 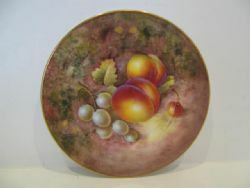 A Royal Worcester Fruit Painted Saucer BY J. Cook. 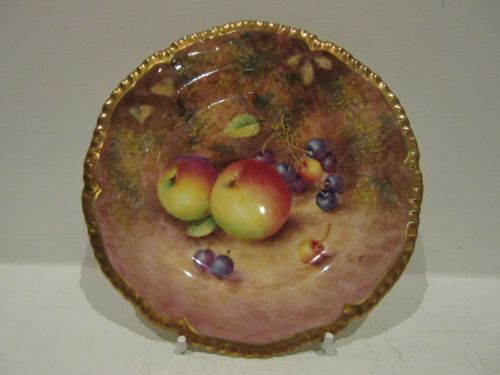 A Royal Worcester porcelain saucer with heavily gilded and shaped gadrooned rim, decorated with well painted apples and green and purple grapes all against a mossy background, by John Cook. 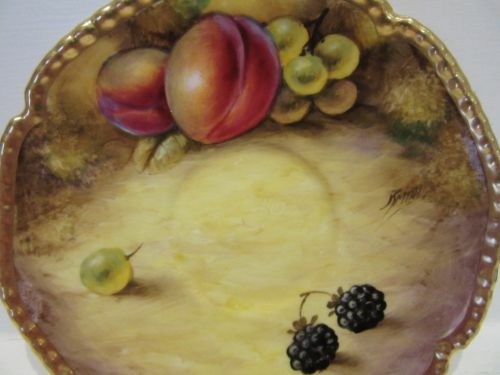 Measuring approximately 5.7/8"diameter, it has the black factory stamp for circa 1970 and is in excellent condition with no damage, crazing or restoration and the gilding is bright and virtually without wear. 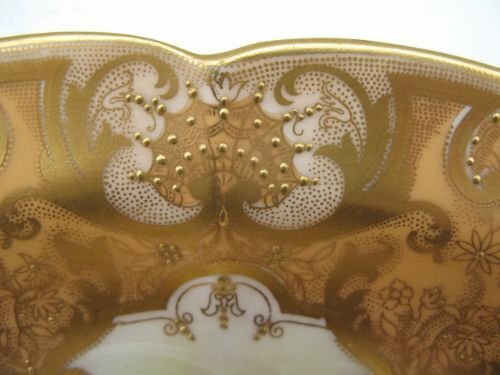 For anyone who has damaged or broken a gadroon-edge saucer and needs to re-unite the cup with a replacement, this is your chance, as they are hard to come by. 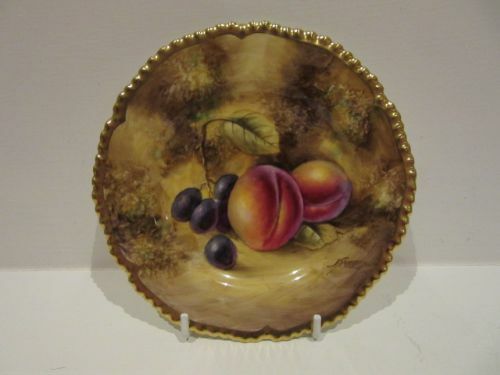 A Royal Worcester Fruit Painted Saucer By John Smith. 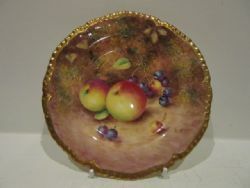 A large, Royal Worcester porcelain saucer, with fruit painted decoration by John Smith. 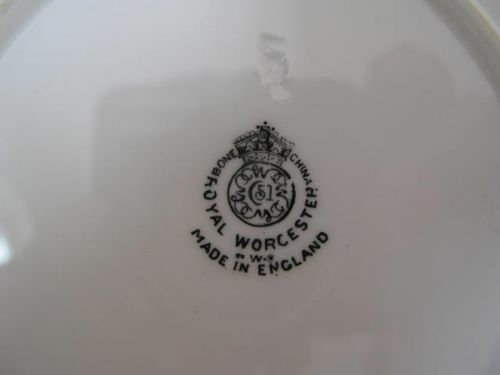 Standing 6.1/2" diameter x 1" deep and with black factory stamp for circa 1965/70, it is in good condition with no damage, crazing or restoration, and the gilding is in unworn condition with only a few small scuffs to the well where the cup would sit. 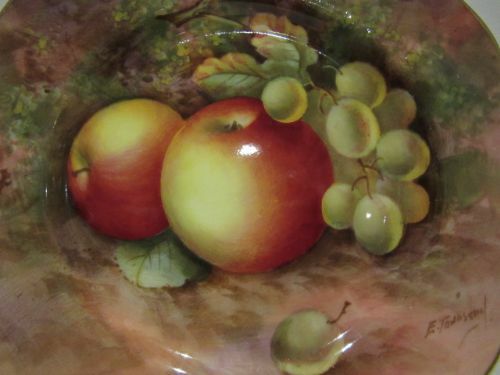 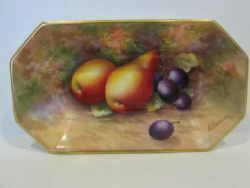 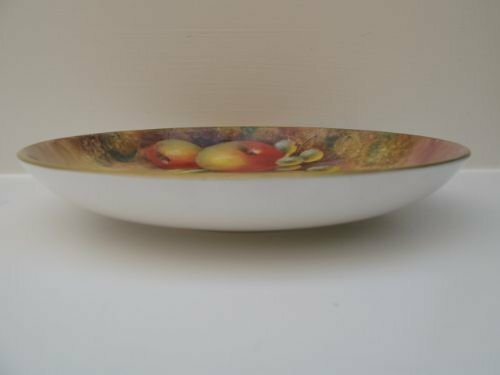 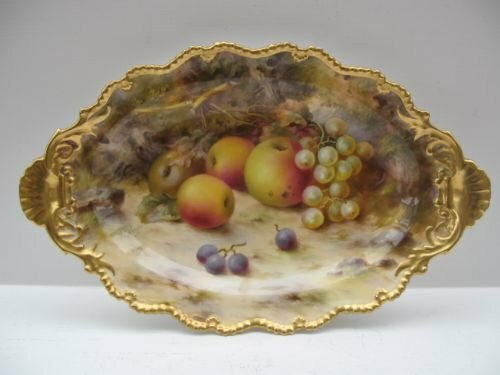 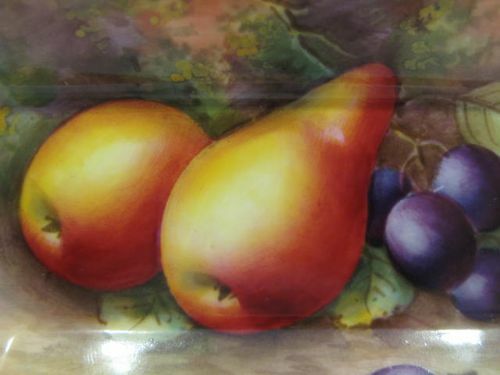 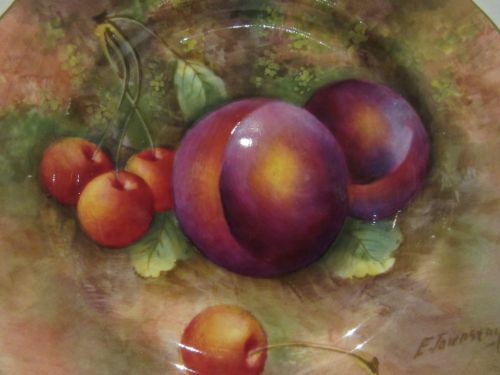 A Royal Worcester Fruit Painted Serving Dish By J. Freeman. 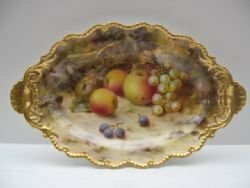 A good, Royal Worcester porcelain serving dish, with shaped, heavily gilded border and well painted fruit decoration by John Freeman. 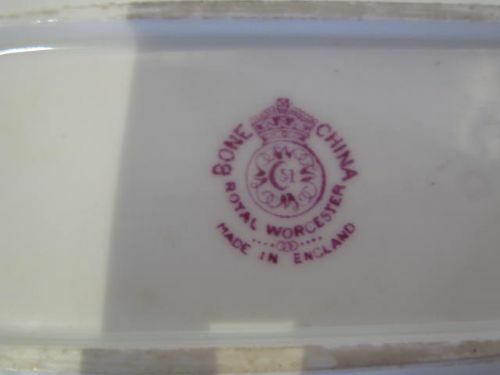 Standing approximately 12"long x 7.1/2"wide x 2"deep and with the black factory stamp for circa 1970, it is in excellent condition with no damage, crazing or restoration, and the gilding is fresh and unworn. A Royal Worcester Fruit Painted Shaped Dish By Albert Shuck. 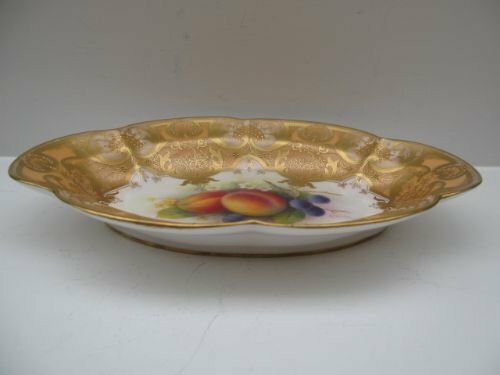 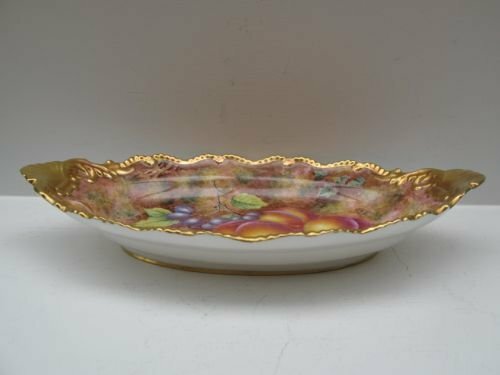 An attractive, Royal Worcester porcelain shaped oblong serving dish, with superbly gilded border and very well painted central fruit panel by Albert Shuck. 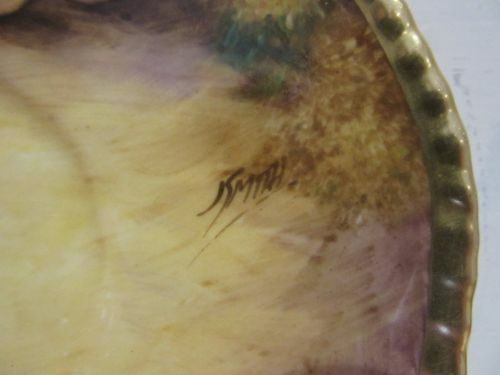 Measuring approximately 10.3/4"long x 7.1/2"wide x 1.1/2"deep, it has the puce factory stamp for 1925 and is in very good condition with no damage, crazing or restoration, and the gilding is fresh and unworn The only issue is that there is a light scratch to the left hand grape as can be seen in picture 3. 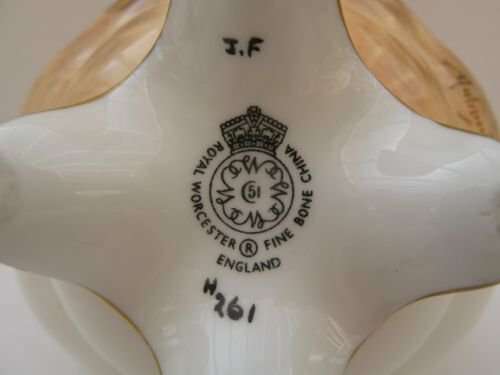 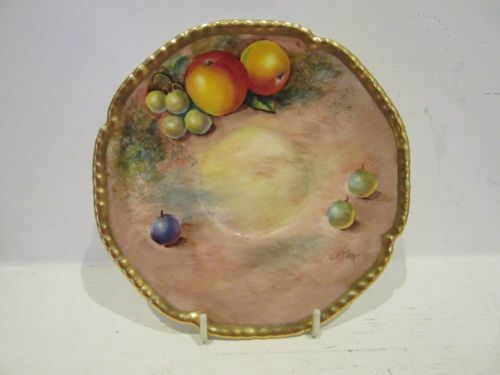 A Royal Worcester Fruit Painted Shaped Dish By Frank Roberts. 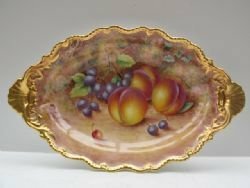 A good, Royal Worcester porcelain dish, with shaped, heavily gilded border and excellently painted fruit decoration by Frank Roberts. 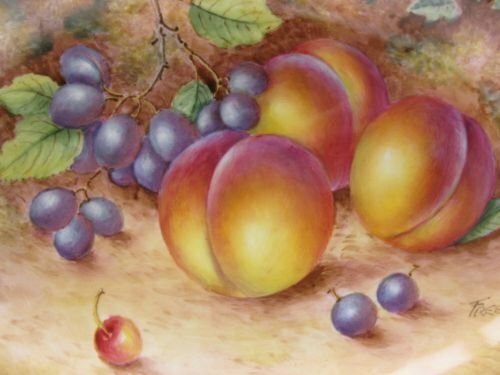 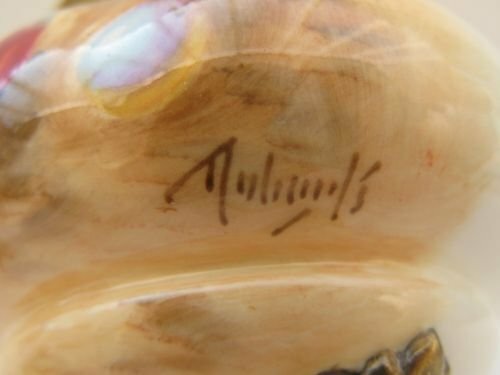 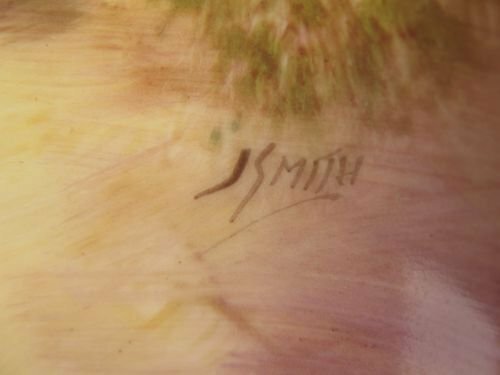 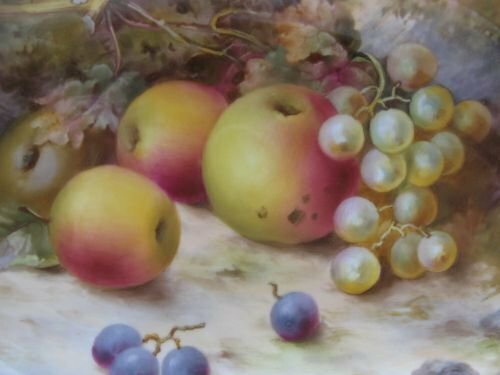 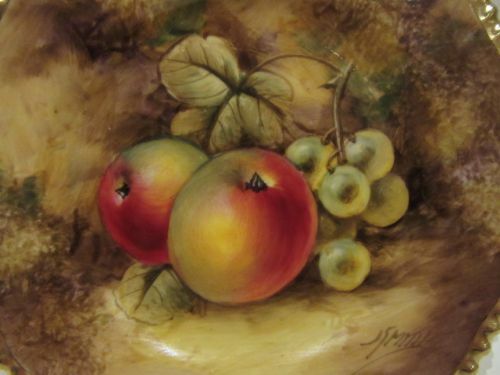 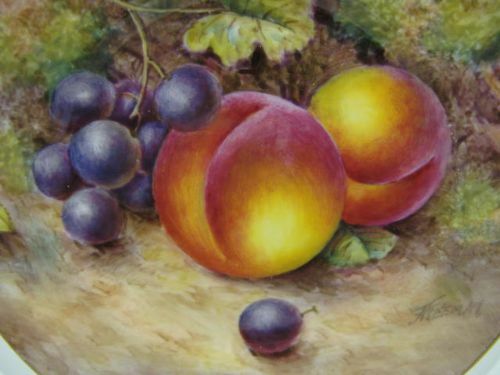 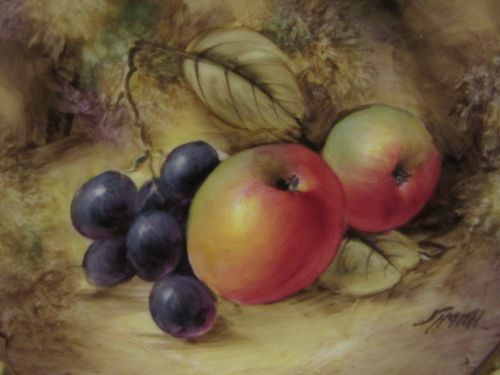 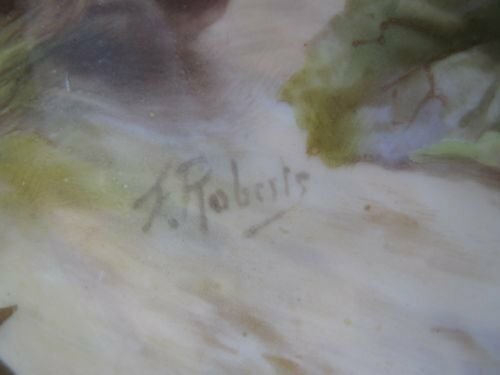 He is listed in Sandons "Royal Worcester Porcelain" as a "very fine fruit painter", his work being given as examples for the apprentices to practice in their training. 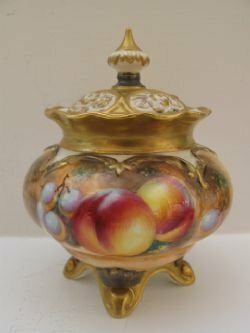 Standing approximately 12.1/4"long x 7.1/2"wide x 1.3/4"deep, it has the puce factory stamp for 1917 and is in excellent condition with no damage, crazing or restoration, and the gilding is virtually without wear. 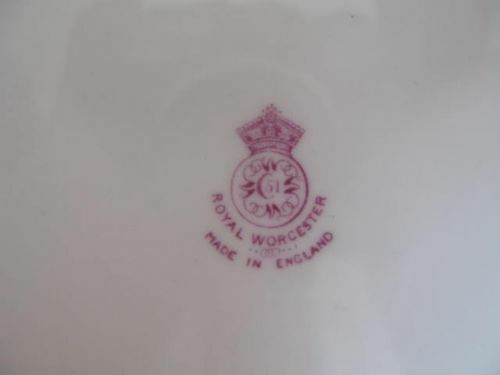 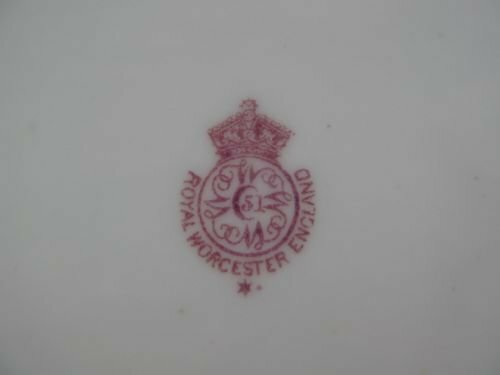 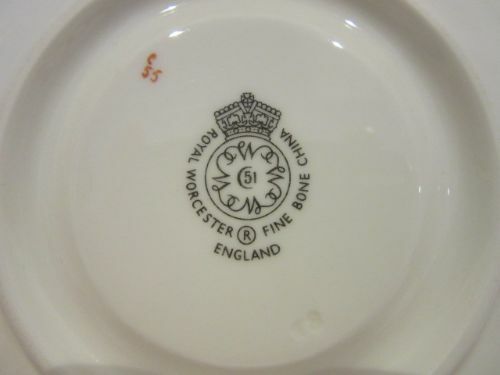 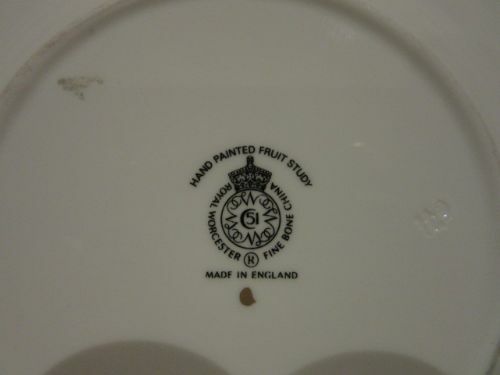 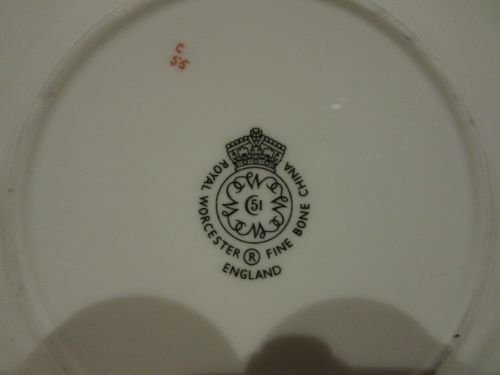 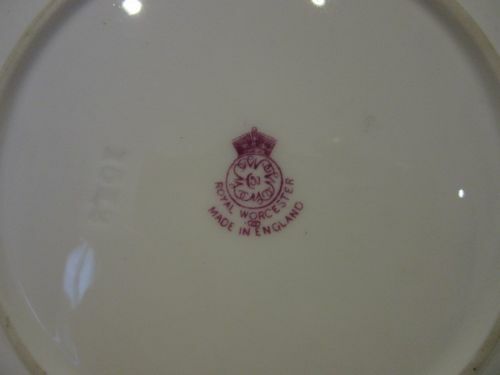 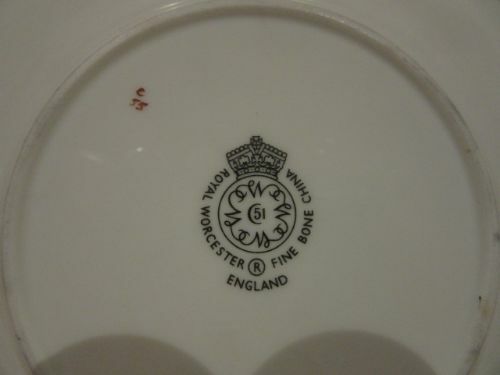 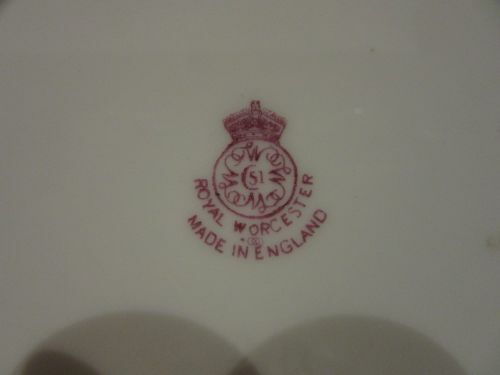 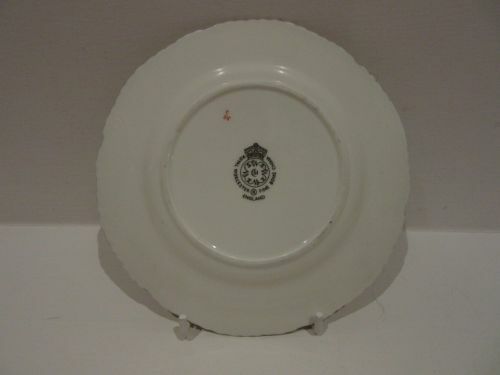 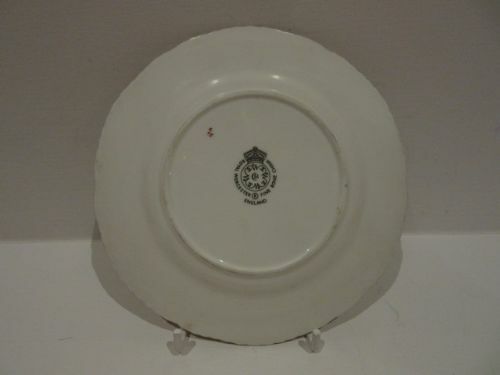 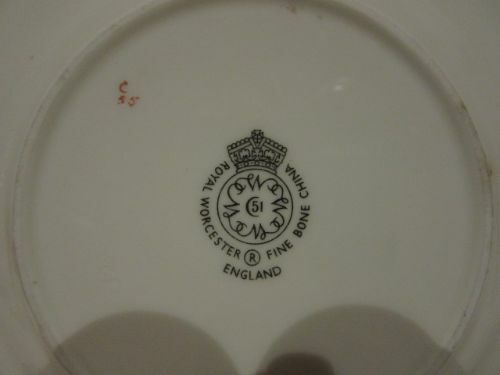 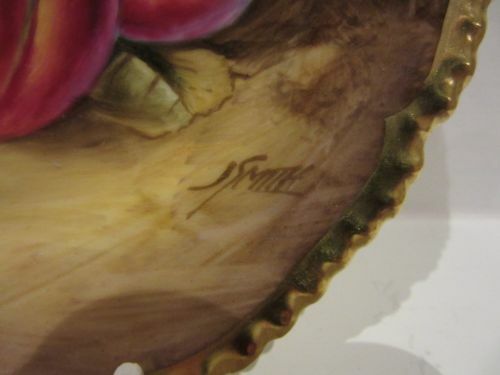 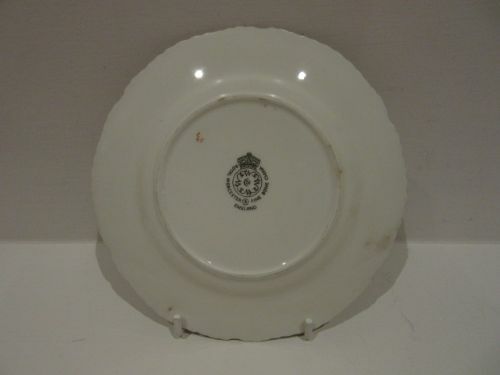 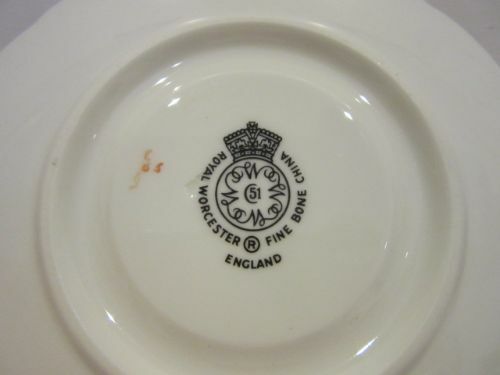 A Royal Worcester Fruit Painted Side Plate By Cook. 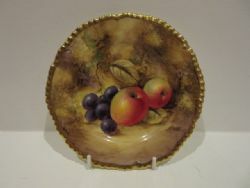 A Royal Worcester porcelain side plate, with painted fruit decoration by John Cook. 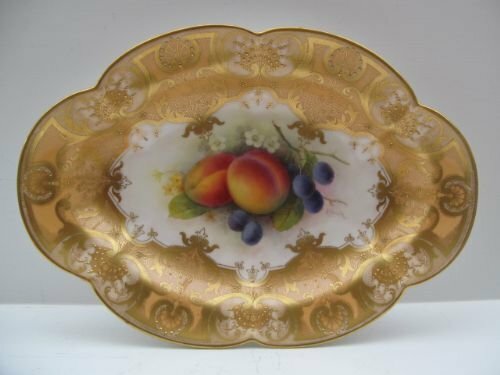 Measuring approximately 6.1/8"diameter, it has the black factory stamp for circa 1975 and is in excellent condition with no damage, crazing or restoration, and the gilding is virtually without wear. 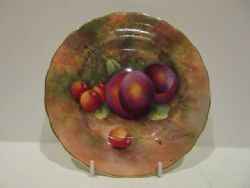 A Royal Worcester Fruit Painted Side Plate By Edward Townsend. 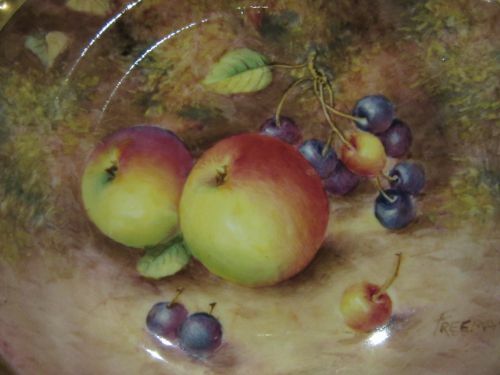 A good Royal Worcester porcelain side plate, with well painted apples and black cherries against a mossy background by Edward Townsend. 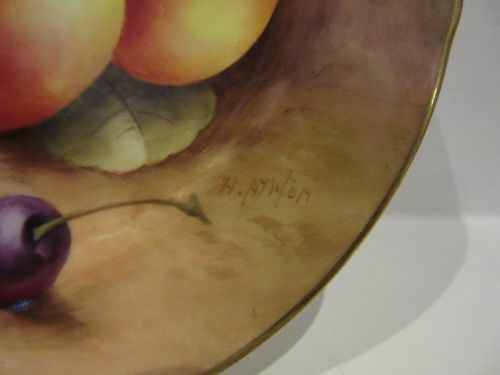 Measuring approximately 6.3/8"diameter x 5/8"deep, it has the puce factory stamp for 1933 and is in excellent condition with no damage, crazing or restoration and the gilding is virtually without wear. 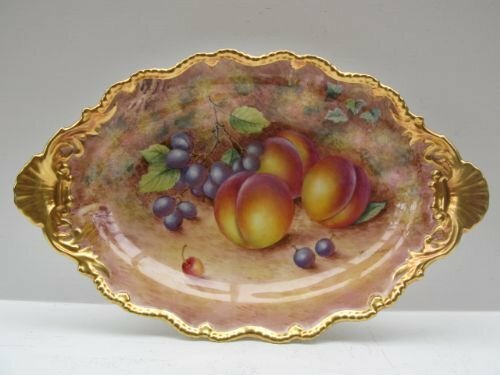 A good Royal Worcester porcelain side plate with well painted plums and red cherries against a mossy background by Edward Townsend. 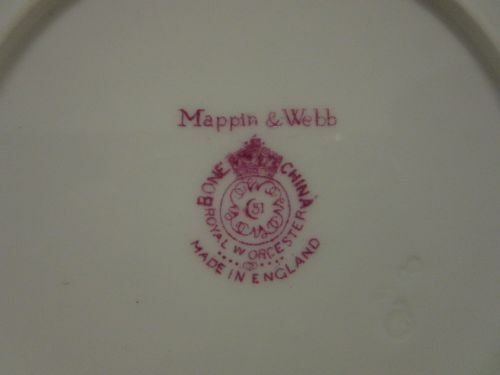 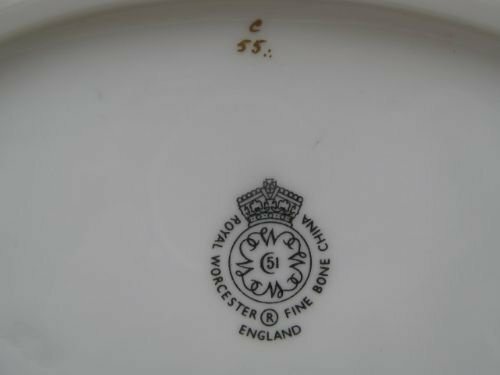 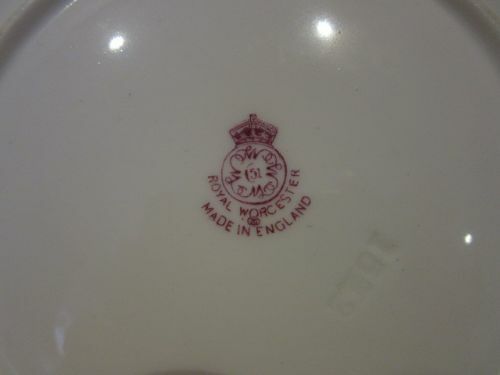 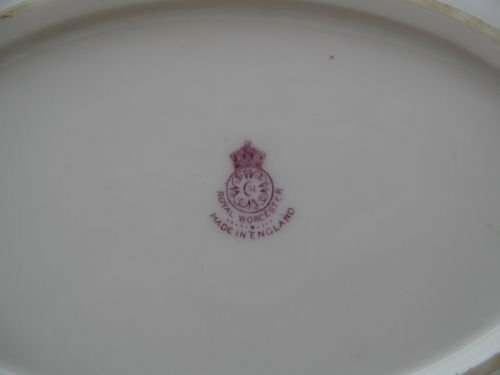 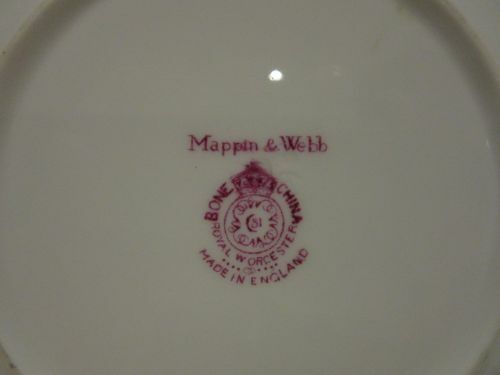 Measuring approximately 6.3/8"diameter x 5/8"deep, it has the puce factory stamp for 1940 and retailers stamp for Mappin & Webb, and is in excellent condition with no damage, crazing or restoration and the gilding is virtually without wear. 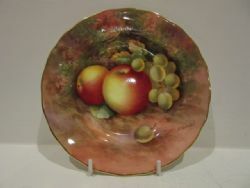 A good Royal Worcester porcelain side plate, with well painted apples and green grapes against a mossy background by Edward Townsend. 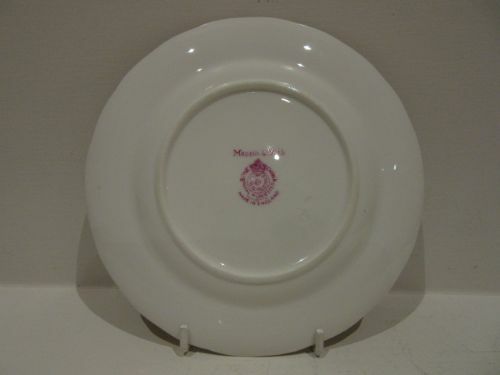 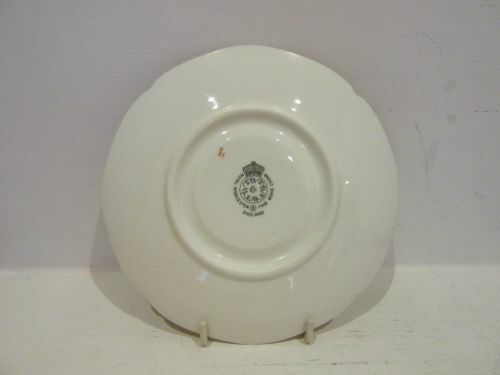 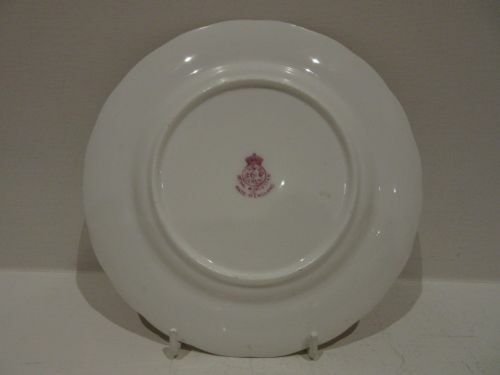 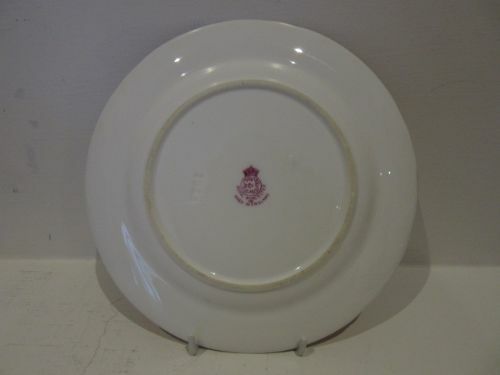 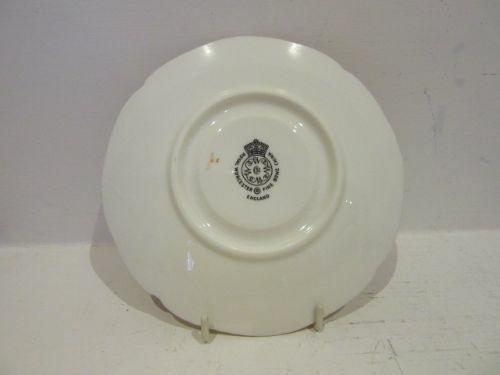 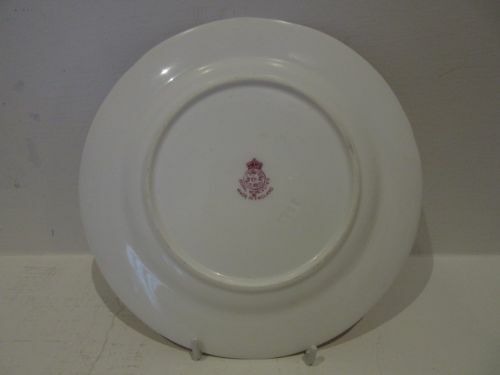 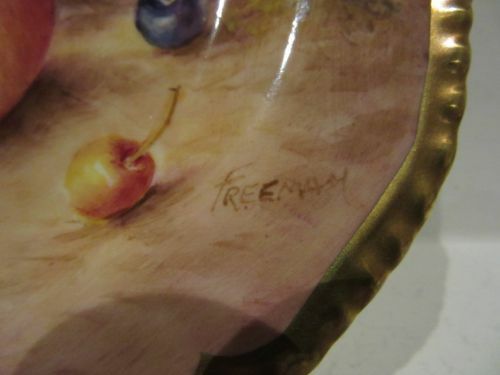 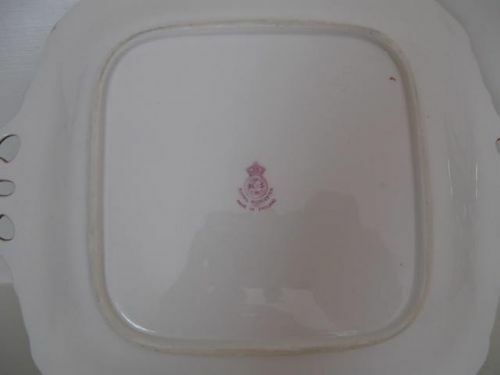 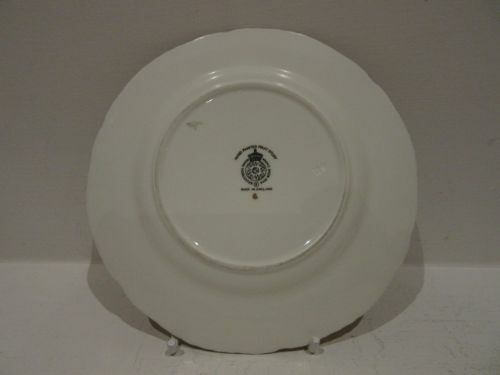 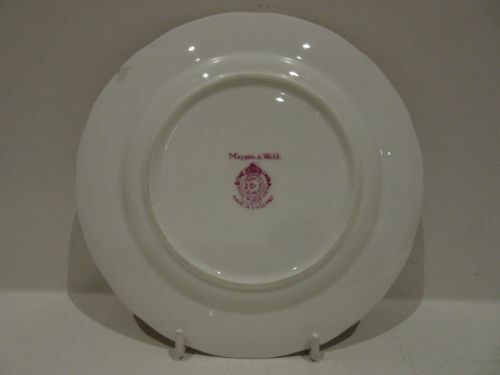 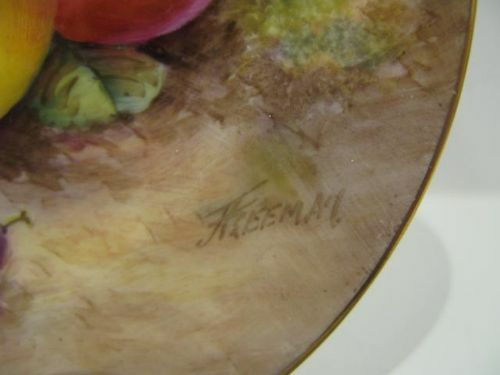 A Royal Worcester Fruit Painted Side Plate By Freeman. 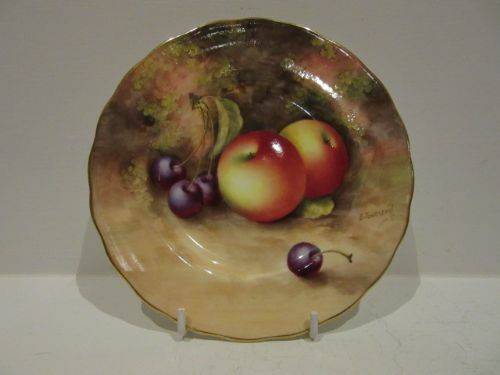 A Royal Worcester porcelain side plate with heavily gilded rope-twist rim, and decorated with well painted apples and cherries against a mossy background by John Freeman. 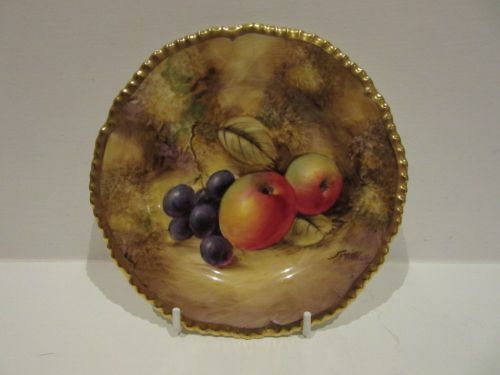 Measuring approximately 6"diameter x 5/8"deep, it has the black factory stamp for circa 1980 and is in excellent condition with no damage, crazing or restoration and the gilding is bright and virtually without wear. 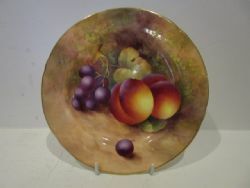 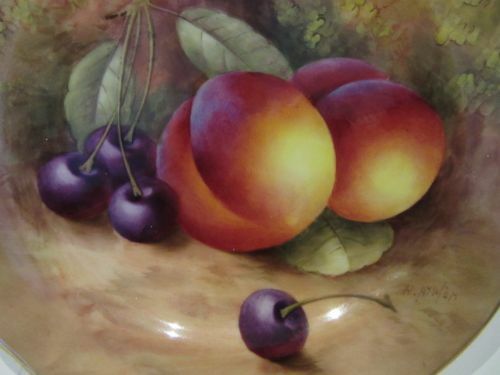 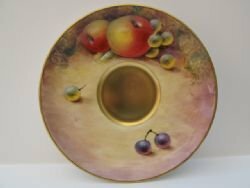 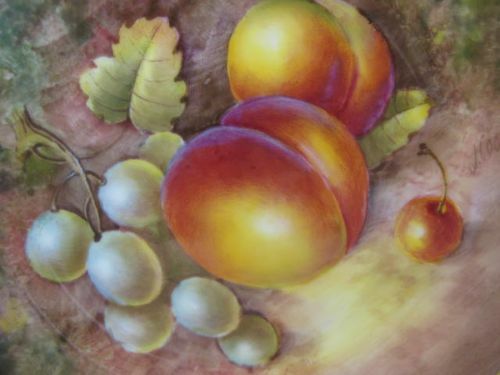 A Royal Worcester porcelain side plate with well painted fruit decoration by John Freeman. 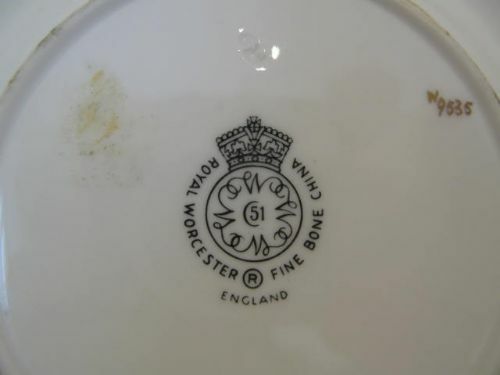 Measuring approximately 6"diameter, it has the black factory stamp for 1954 and is in excellent condition with no damage, crazing or restoration and the gilding is bright and virtually without wear. 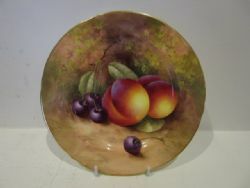 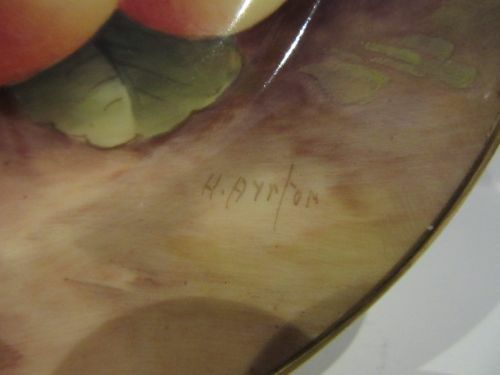 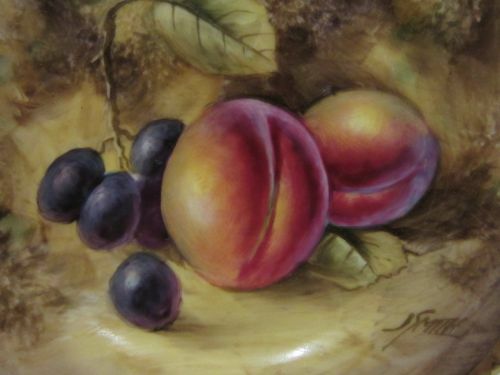 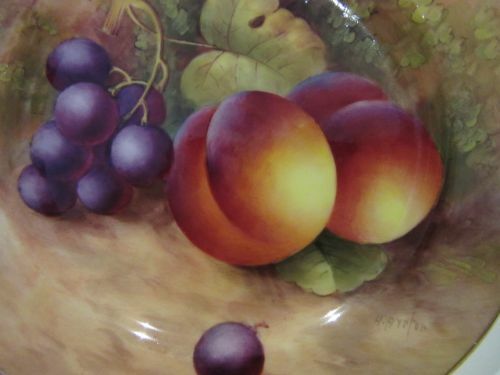 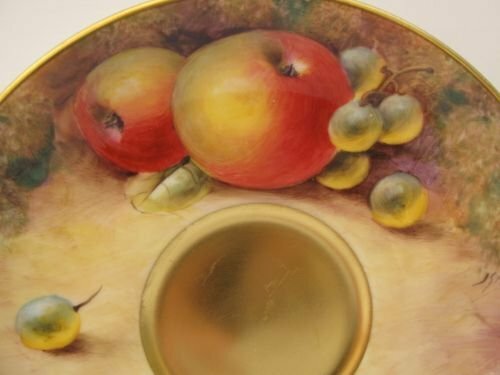 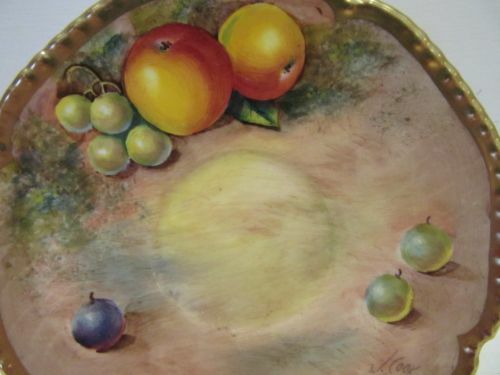 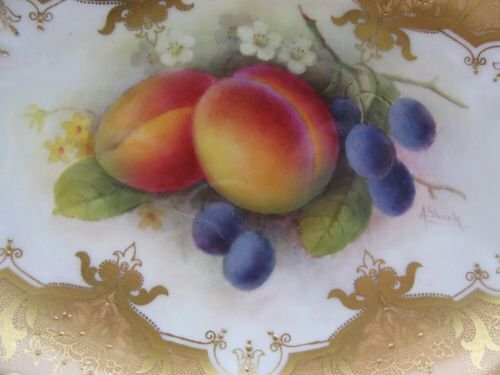 A Royal Worcester Fruit Painted Side Plate By H. Ayrton. 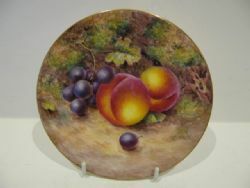 A good Royal Worcester porcelain side plate, decorated with well painted plums and black grapes against a mossy background by Harry Ayrton. 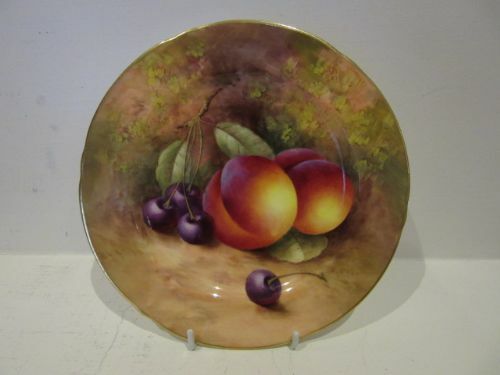 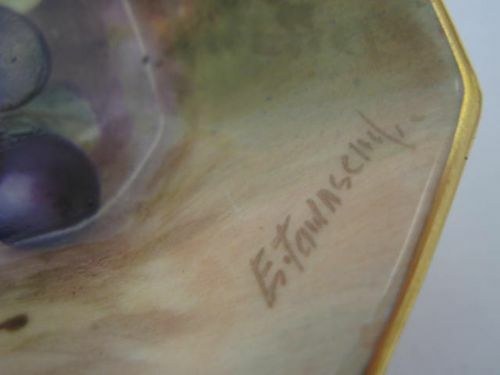 Measuring approximately 7"diameter x 5/8"deep, it has the puce factory stamp for 1933 and is in excellent condition with no damage, crazing or restoration and the gilding is bright and virtually without wear. A good Royal Worcester porcelain side plate, with well painted plums, black cherries and foliage against a mossy background by Harry Ayrton.